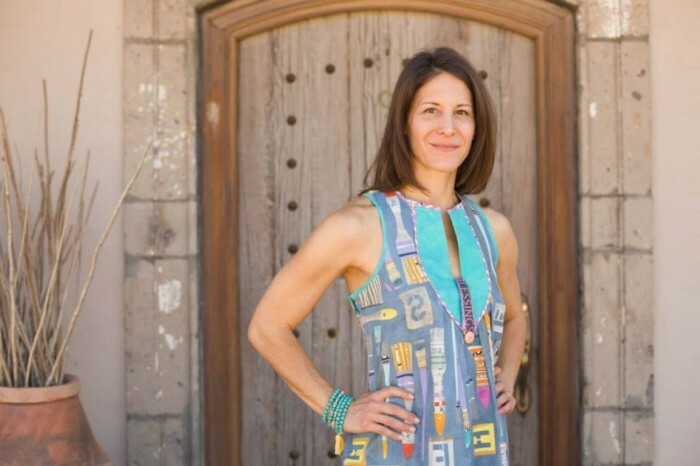 For Carrie Bloomston, celebrating your inner artist is a life’s mission. In her last collection, Collage, she blew everyone away with the uniqueness of her concept and the richness of her colors. You can see what I made last time here. Since then, Carrie has written a book, and continued to inspire her local community with classes. Her newest collection picks right up where she left off. Carrie is an abstract painter, so naturally it was time for Paint as the theme. This collection continues to highlight her collage technique, and brings it along even further. I asked Carrie what she’d like me to create for her this time, and she said – Oh, Karen, do your thing! We had a really short time period in which to actually create the garment, so drafting a custom dress was out of the question this year. I checked out Carrie’s To Make board on Pinterest. What better way to delight Carrie than to make her something she already admires? I knew the Simone Dress from Victory Patterns was The One as soon as I saw it. I had never heard of Victory Patterns before, but I’m so happy I found this in her collection of desired makes, because it seems to be the perfect dress for Carrie. I wanted to use as many fabrics as I could, while not visually overpowering Carrie’s tiny frame. I was relieved that the dress came together so easily, since it does appear to be quite complex. I made only minor construction modifications to finish the inside with a full bodice lining so I could enclose all the seams, knowing Carrie will be wearing this often. We also wanted to show the fabric on the inside of the dress because the asymmetrical hem, while beautiful, tends to show a lot of the wrong side of fabric when worn. I partially lined the back skirt to prevent the wrong side of the fabric from showing. I also bound the raw edges visibly, instead of turning them to the inside for a clean finish for one last POP of color. Windham Fabrics put together a beautiful lookbook here, and catalog within a very tight timeline. I shared some details along the way during the day and a half I used to make and return the dress for the photo shoot you see above. Carrie’s fabric allows for fussy-cutting to be meaningful. Piping detail on the dress back. A wide bound hem for weight and beauty. PAINT is now selling to shops so tell your favorite local fabric store to place an order soon to get the fabric for you in July/August. The PAINT collection celebrates creativity and expression. As a creativity enabler, Carrie intends to help you Celebrate your inner artist™! The collection includes bold, playful prints inspired by a painter’s tools. Color wheels, paint swatches, paint brushes and other collaged images create an artful pastiche of sewing possibility. Carrie loves to make something from nothing. She showcases up-cycling and recycling by creating her imagery from brown paper bags, paint swatches and colorful newsprint. PAINT tells the truly inspiring story of stepping into a creative life. Additionally, we are pleased to rerelease her wildly popular Newsprint in three color ways. You can read more about PAINT on Carrie’s blog, leave a comment below to enter a drawing to win a charm pack of PAINT from Windham. wow – that dress is amazing :-) Love the fabrics you chose for it. Beautiful dress! I wish I could sew garments. I would like to use these fabrics in a quilt for my granddaughters. What a stunning dress!! and it shows off Carrie’s fabrics so well! What a really stunning dress. I love the idea of the semi lined asymetric hemline and binding it is a really inspired idea. 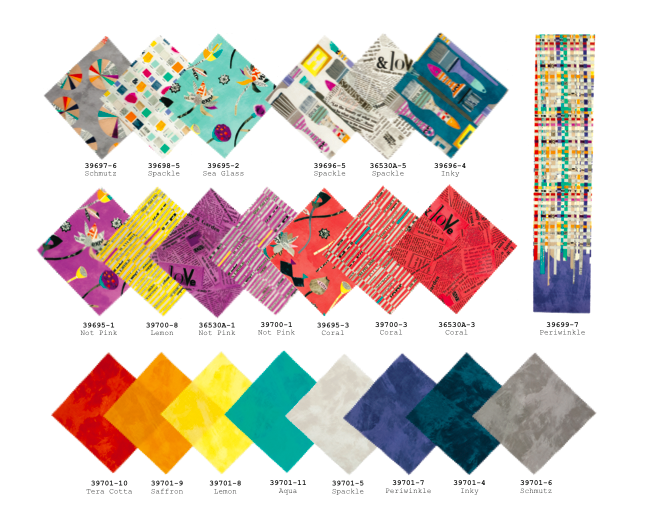 I’m already looking forward to this collection hitting the shops as I had some quilty plans for it but I am defintiely now inspired to make a skirt for myself in the paintbrush or swatch prints. I love these fabrics and the dress you made is beautiful. Thanks! Love the close-ups of how you used the fabrics! Great inspiration!! What a great looking dress! I’d love to play with this new collection. It has such great colors! Wow! A dress in a day and half, you are amazing! It’s beautiful, I love the new fabric collection Carrie has created, and thanks for the giveaway! Gorgeous dress! I think you should make one in every PAINT print. I LOVE this dress, and adore the fabric! Great job. Wow – so beautiful! And bold. I love how you have used Carrie’s fabric this time! The dress you made is beautiful! And I love the story you told about your daughter below, so thought provoking and now I will also write my children’s names down on my to do list. The dress is just stunning, truly unique! Woah! That dress is amazing – very different and I love the fabric choices too! That dress is SPECTACULAR! Such detail & use of color. The best project of all on the blog hop! I love the new Paint line, and what you’ve done with it. The dress Carrie is modelling, rocks! Hope I win the giveaway! Cheers! Totally I love with your bindings! A big WOW on the wide hem detail! Beautiful dress and fabric! Thanks for the giveaway. I like the design of the dress very much! And the color blocking is great! I’ll have to look through your gallery when I have more time! congratulations on a terrific project. You are the best dressmaker in the whole world!! It is so awesome! Love the use of this pattern and fabric together! Such a good way to showcase great arms! LOVE the dress you made and the collection is beautiful. Oh I do love that dress and fabric. You HAVE to just love BOTH! I am completely in love with the fabric and can’t wait until it is openly available. I am loving this line of fabric more and more each time I see it. It makes a fabulous dress!!! The dress is so cute! Love Paint, what a great new line. The dress you made is gorgeous! I love Carrie’s work – she’s awesome too! Fabulous dress…so happy to have found your website! Wow! The dress is awesome! And thanks for your inspiring blog! I love that Carrie is an upcycling artist! This is great! I love the use of multiple prints. The dress you made her from the Collage collection inspired me to purchase fabrics from that collection — and I think you may have just done it again! :) I need to check out this pattern maker too! Next Post: Classic Typography. Classic Snark.